Grail's plan has brought the Justice League to a final conflict, as she unleashes Steve Trevor, who is possessed of the Anti Life Equation, to destroy the League and all around them. However, Steve Trevor is not the chosen one that Grail believes him to be, and he's able to resist, albeit minimally. Grail revokes the Anti Life equation and infuses it into Superwoman's baby, giving new life to Darkseid. Under Grail's control, Darkseid presses the conflict, but Myrina Black makes the ultimate sacrifice to defuse Grail's bloodlust. The battle ends, but leaves new revelations, and the ominous scene of Grail seeking to raise baby Darkseid. 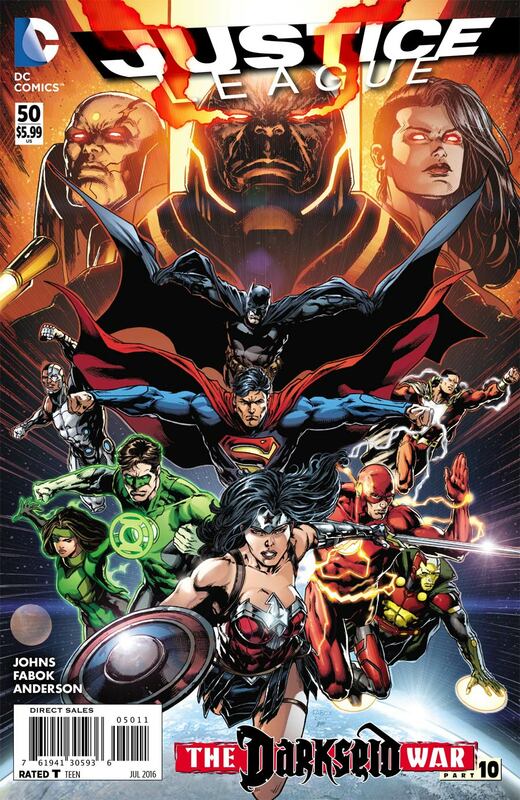 Story - 3: "The Darkseid War" is a tale five years in the making, starting with the initial issues of the New 52 Justice League. For it to be completed in this manner is a testament to the dysfunction that is DC Comics under the N52 direction. This story began with a healthy amount of promise when it began, as looked to tie up many of the threads that led into the story. However, due to circumstances beyond its control, "The Darkseid War" became a decompressed, padded prop that supported nothing, and was aced to the side for Rebirth. A reader who diligently follow this storyline would be hard pressed not to see the jump from a concluding tale, to a stepping stone for what events will transpire in the next pseudo-reboot for DC Comics. "The Darkseid War" turned from a healthy finish to Johns solid, if unimaginative run on Justice League, to an over stretched, over stuffed interlude, that serves no purpose other than to get the title to #50. There were plenty of opportunities with the tale that were ultimately abandoned on set. Steve Trevor being the "chosen one". The child of Superwoman. The League with the powers of New Gods. 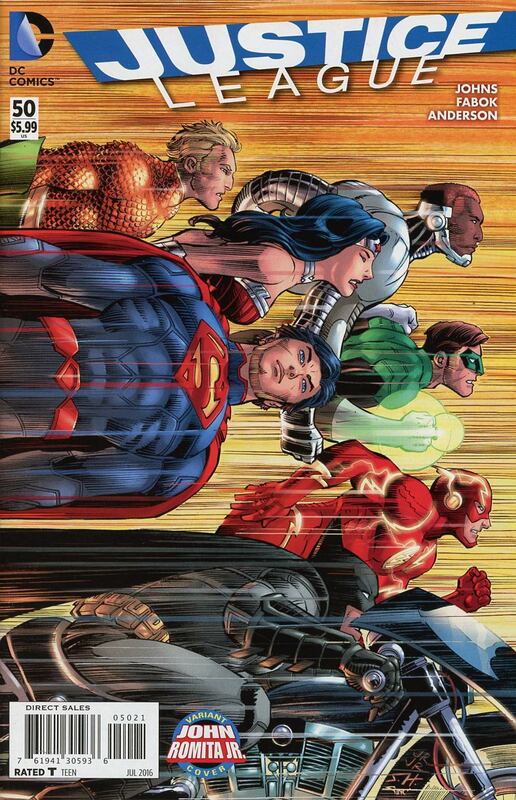 Instead, all of those threads were burned or served as fodder to service the latest direction has undertaken, simply because the initial direction of The New 52 was aimless and sprawling; a needless restart that has forced a hard about and the closing chapter of Justice League is one of the casualties of no horse or cart, and still needing to go to market. The last page splash is the proverbial gauntlet lashed against the face, showing any reader that time, money, and interest were ultimately for nothing. Art - 4: Fabok's work is a bright point, reminiscent of Gary Frank's work on Squadron Supreme, and also DC Comics approach of pretty pictures to sell stories that just aren't there. Cover Art - 3: See ya later! Much later!